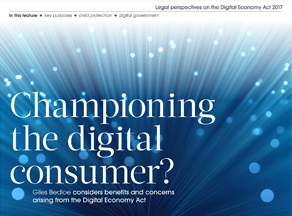 In this comment piece, Giles Bedloe dissects the Digital Economy Act. Whilst there are tangible benefits to consumers in terms of internet safety and service provision, it remains to be seen how Part 5 (‘Digital Government’) will be implemented. Giles highlights various issues, including how the provisions relating to the disclosure and exchange of information to improve public service delivery might be seen as a cause for concern by privacy campaigners. TS Today is a publication produced by the Chartered Institute of Trading Standards Institute to inform and deliver influential academic research, news analyses, topical features and a range of opinions and perspectives about trading standards and the wider issues that affect it. See below and click the image for the full article.